Fits All Kirby Vacuum Cleaners Built in 1989 and later. All Kirby Power Drive Generation Series. After time you have probably found that the rubber has worn of your Kirby Rear wheels. This causes the nozzle to not properly enlighn with the florr surface, thus reducing your Kirby's cleaning efficiency. Since these are the drive wheels for your Kirby Power Drive, the self proppelled part of your machine willnot propell you machine as well. 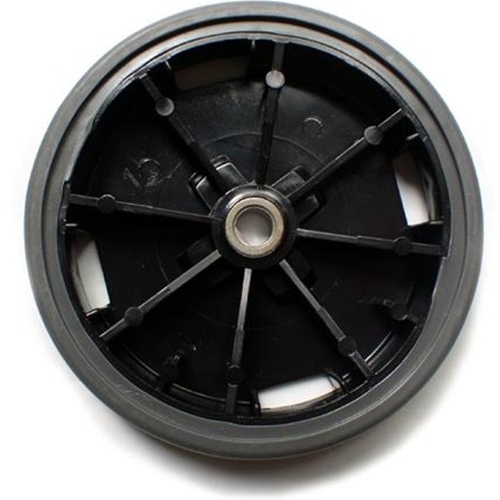 Replaced those old worn wheels with new ones and get your Kirby Vacuum cleaning like it used to. These wheels are sold individually however I highly recomend you replace both at the same time.